For incumbent US presidents looking to keep their job, what seems to really matter is whether everyone else is keeping theirs. The number of observations is admittedly small but the track record is flawless: since World War II incumbents running for a second full term won when the unemployment rate was falling and they lost when it was going up. In the past sixty years, seven incumbent US presidents ran for a second full term. Five of them won the popular vote (the green dots in the chart) with a margin of victory that was inversely correlated to the election-year change in the unemployment rate. In 1956, Dwight D. Eisenhower successfully ran for his second term when the unemployment rate was 4.1%, down from 4.4% the year before. Improvements in the unemployment rate also marked the reelections of Richard Nixon, Ronald Reagan, Bill Clinton, and George W. Bush. The two incumbents who lost their reelection campaigns (the orange dots) faced a rising unemployment rate: Jimmy Carter in 1980 and George H.W. Bush in 1992. The level of the unemployment rate alone gives little guidance. The unemployment rate in 1980 was 7.2%, up considerably from the year before; Jimmy Carter duly lost his bid for reelection. In 1984, the unemployment rate was actually higher at 7.5%, but was on its way down from the previous year; Ronald Reagan was reelected in a landslide. In both cases, it was the trend that mattered. Two other incumbent presidents chose to drop out of their reelection races. However, the unemployment trends at the time hint at a tantalizing alternate history. Harry S. Truman finished FDR’s fourth term and then narrowly won a close election of his own, but sagging poll numbers led him to pull out of running for a second full term in 1952. Perhaps he should have run anyway: the unemployment rate went down that year. Similarly, Lyndon Johnson completed JFK’s term and successfully campaigned for his own first term, but in early 1968 famously declared he would no longer seek reelection. Unemployment also went down that year. Without exception, post-war US presidents won a second full term if the unemployment rate went down during the election year, and vice versa. 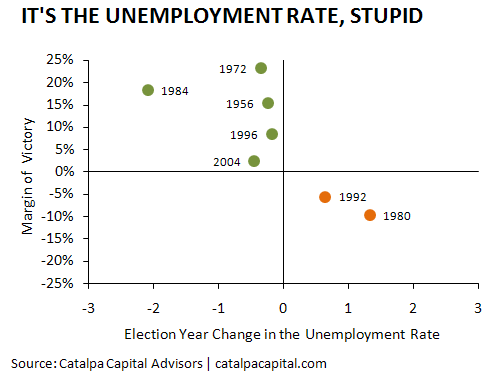 In 1992, Bill Clinton defeated an incumbent US president with the campaign motto, “It’s the economy, stupid.” As it turns out, at least for incumbents running for a second full term, it’s really just the unemployment rate. The information presented in this presentation (the “Presentation”) has been prepared solely for informational purposes and is not an offer to buy or sell or a solicitation of an offer to buy or sell Interests or any other security or instrument or to participate in any trading strategy. No representation or warranty (express or implied) is made or can be given with respect to the accuracy or completeness of the information in this Presentation. No person has been authorized to make any representations concerning the Interests described in this Presentation that are inconsistent with the statements contained in this Presentation.